The geopraphical position of Kathiawad, or Saurashtra as it was originally called, almost surrounded as it is by water, cuts it off from the rest of the mainland, save in the north where, by a narrow neck, it joins on to northern Gujarat. 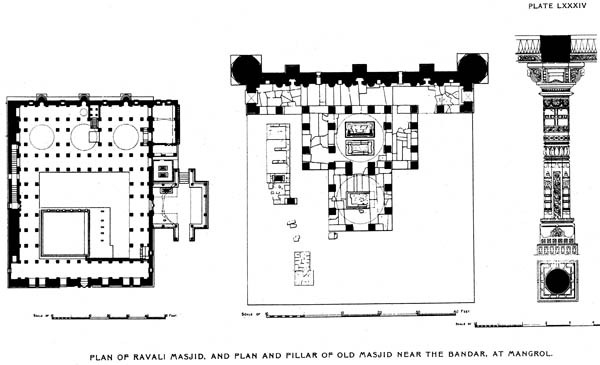 Its isolation was, perhaps, in olden times, more complete that it is now, when the gulf of Kachh, in its upper reaches, penetrated further inland and was not so far separated from the head of the gulf of Cambay. Its connection with Gujarat and Rajputana, on the north, has resulted, especially in mediaeval times, in its historical associations with those countries being very closely interwoven. From early days the peninsula has thus formed a complete cul-de-sac to invasions from the north, not only of tribes bent upon exploiting new regions and seeking new homes, but also of architectural styles and modes of worship which, filtering southwards through the Panjab and Sind, entered the country only to be brought up against its encircling belt of waters, and to spread along its southern shores. 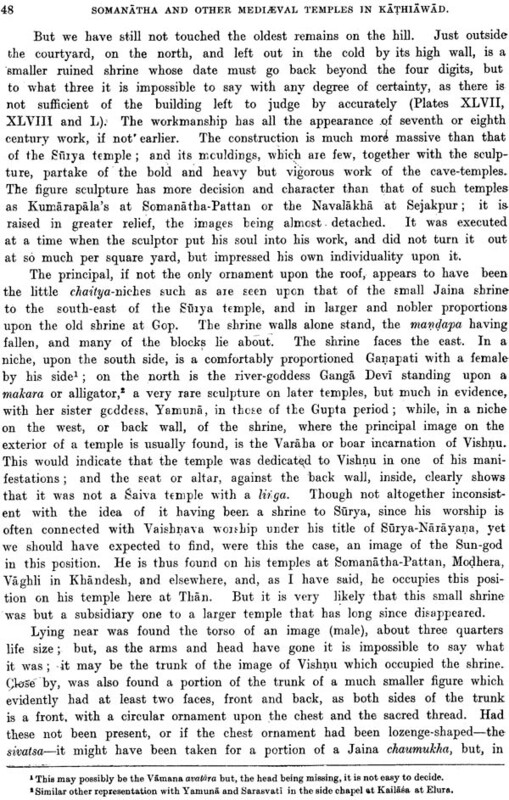 Hence the prevalence, in these parts, in early times, of Sun-worship and temples whose ruins show a remarkable likeness to those to be found in the valleys of Kasmir. 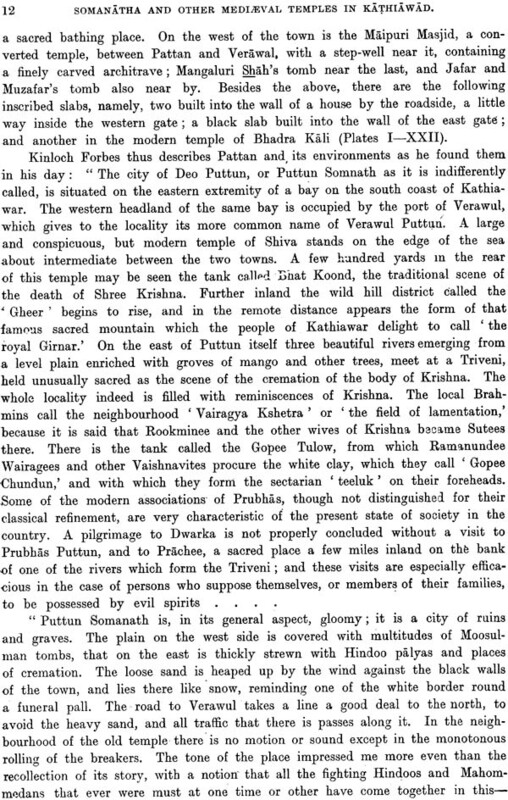 The whole of the southern and south-eastern districts constitute classic ground, for it was here that Krishna lived and carried out many of his exploits after his departure from Mathura and it was here, also, in the vicinity of the sacred city of Prabhas-Pattan, that he eventually met his death at the hands of a careless hunter. To describe his achievements in this region would be to repeat much of what may be found in any book upon Hindu mythology. 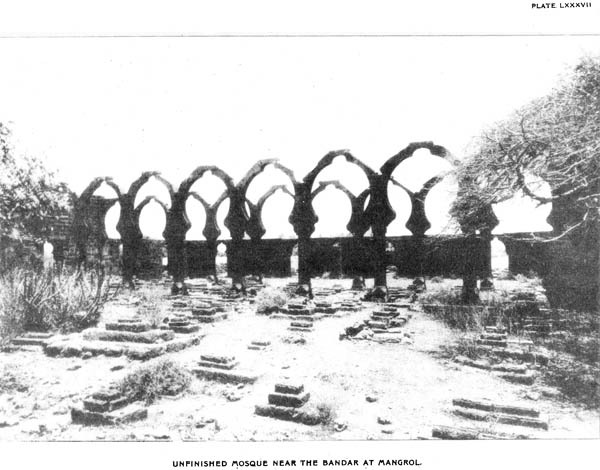 In those early days, when he is supposed to have lived, Saurashtra was only populated, to any extent, around its shores, and the central portion of the peninsula was clothed with forests and was practically unoccupied: it is in the southern and south-eastern parts that the oldest remains are found. For relics of a far-away prehistoric age we have only to go to the little island of Perim, off the coast near Gogo, where the bones of long-extinct mammals are to be found. For relics of a far-away prehistoric age we have only to go to the little island of Perim, off the coast near Gogo, where the bones of long-extinct mammals are to be found, and where the fossilized mammoth has been succeeded by two monolithic elephants, one of which still stood intact upon the shore in 1840. 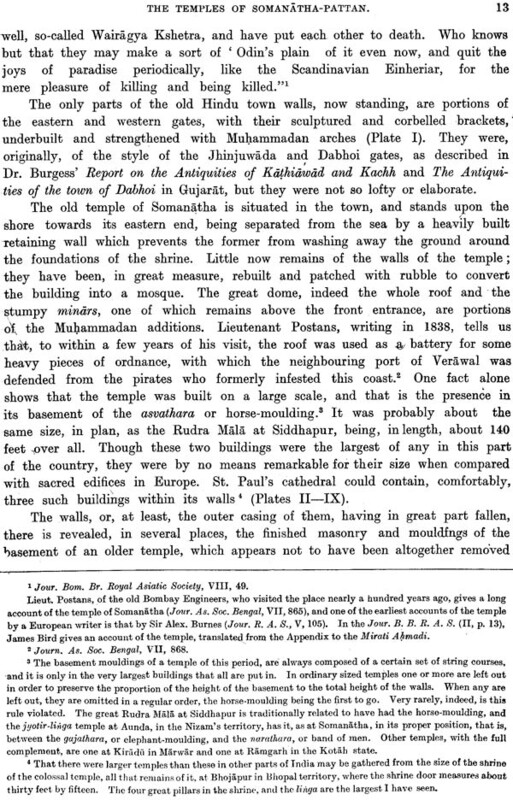 In this south-eastern corner of Kathiawad we have the sites of the ancient towns of Valabhi, Mul Dwarka (the ancient Dwarka, said to have been destroyed by a tidal wave on the death of Krishna), Madhavpur, where Krishna married Rukmini, Tulshishyam, Sudampuri (Porbandar), Vamansthali (Wanthali), and other the Buddhist cave-temples at Junagadh, Talaja, Sana, Dhank and Siddhesvara; and the sacred hills of Girnar and Palitana. 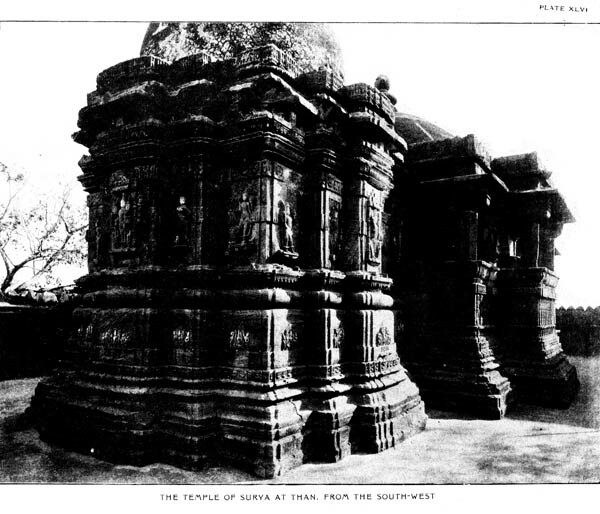 In mediaeval times, however, central Saurashtra must have been well populated, as we can gather from the very numerous ruins of highly decorated stone temples such as are found at Sejakpur, Than, Anandapur, Parbadi, Chaubari and Wadhwan; and it is with these, and the famous shrine of Somanatha at Prabhas-Pattan, together with some along the south coast, that we are concerned in this monograph. 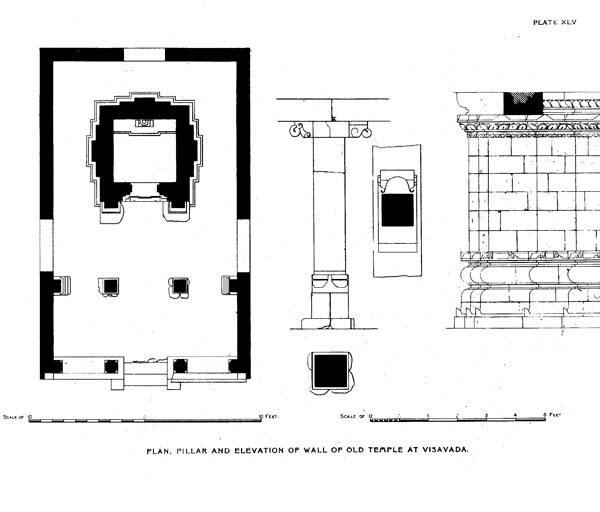 The cave-temples have already been fully described, and the important site of Valabhi, dating from the fifth century A.D., has not yet been sufficiently explored to include it. Saurashtra was included in one of the four provinces into which Chandragupta divided his kingdom about B.C. 332, and the Sudarsana lake, near Junagadh and beneath the slopes of Girnar, mentioned in the inscription on the famous Asoka rock at that place, was constructed by Syena Pushyagupta, governor of the province under that emperor. 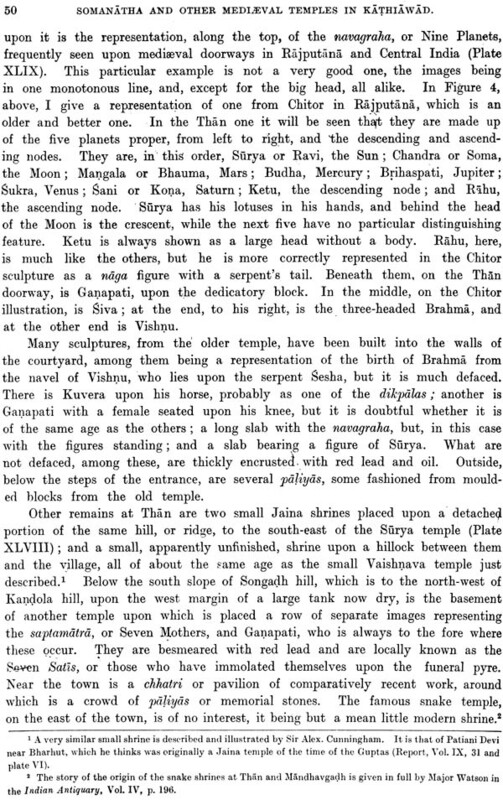 Asoka, though he caused his famous edicts to be published here upon this rock, did not, himself, visit Saurashtra. After the Mauryas, Saurashtra remained under Pushyamitra of the Sunga dynasty until B.C. 155, after which it was conquered and annexed by Menaner, king of the Panjab and Kabul. Later, followed the Sakas, who established the dynasty of Satraps, or Kshatrapas, when Nahapana, the second Kshatrapa king was overthrown by the Andhras and about 338, Saurashtra was added to the Magadh kingdom. After the death of Skandagupta, about A.D. 470, the Bhattarka, or commander-in-chief, of the Hunasi entered Saurashtra, took possession, and declaring his independence, established the line of the valabhi kings which lasted for nearly three hundred years. He placed a governor at Vamansthali and founded Valabhinagar, a city which was, later on, visited by the Chinese pilgrim Hwien Thsang. 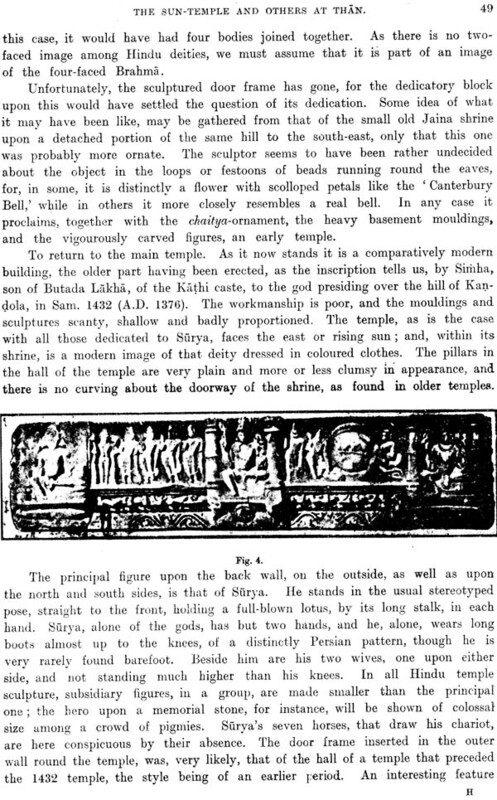 It is recoded in a copper plate grant, which was found at Katpur and is now in the Bhavanagar museum, that Sun-worship was followed by the Valabhi king Dharasena II (A.D. 571). After the fall of Valabhi, the chief inhabitants of Saurashtra were the Rajputs, as represented by the Jethwas, Chavadas and Walas, the latter supposed to be a survival of the Valabhi dynasty. There were also the Ahers, Rabaris, Mers, Bhils and Kolis. The Jethwas were the oldest Rajput race in Saurashtra, their ancestors being supposed to have been the Scythians of the north, who were settled in Kasmir in the first century A.D. The present home of the Jethwa family is Porbandar and it is in this district that those very early shrines are principally found which are so like those met with in Kasmir of the same age. 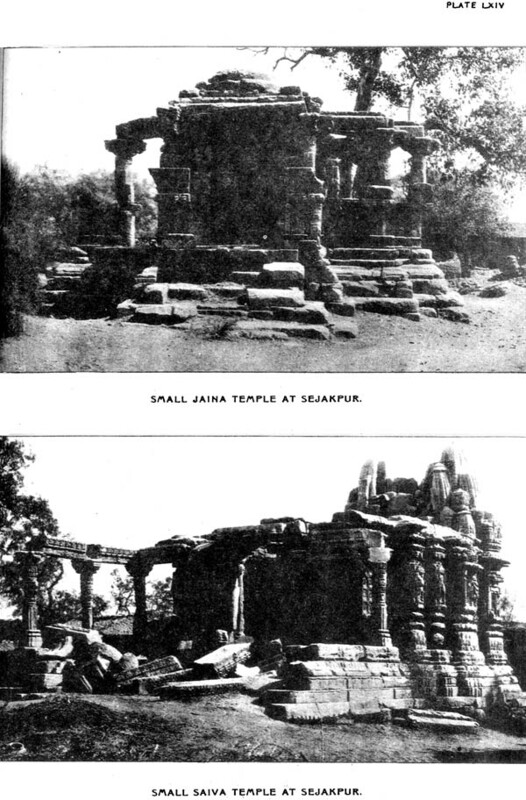 The Jethwas were, at first, established at Srinagar, not far from Porbandar; subsequently they built and fortified Ghumli in the Barda hills, where the ruins of the finest of these old temples are found, whence they moved to Ranpur about 1313, after Ghumli had been conquered and destroyed by the Jadejas, under Jam Bamanioji from Kachh; and then, in 1574, to Chayya, a mile and a half east of Porbandar. 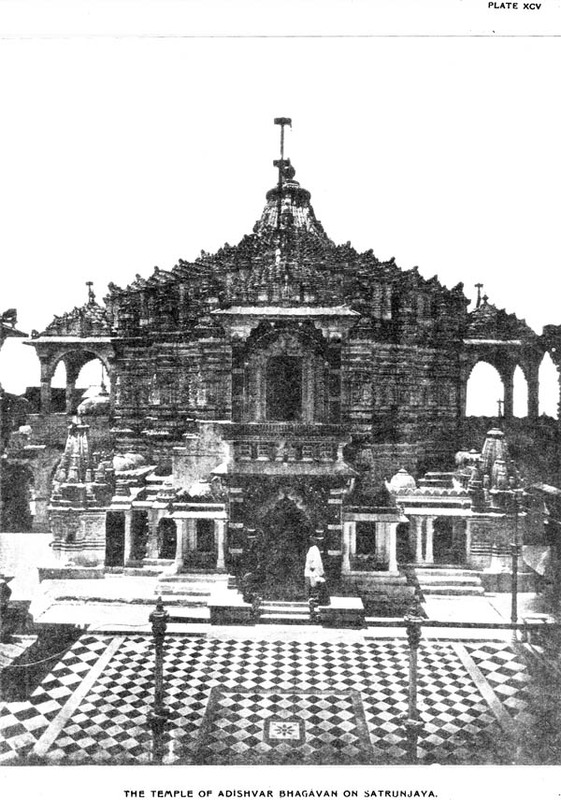 Jethwa bards relate that the fourth ruler of Ghumli built the temple of the Sun at Srinagar in Saurashtra. 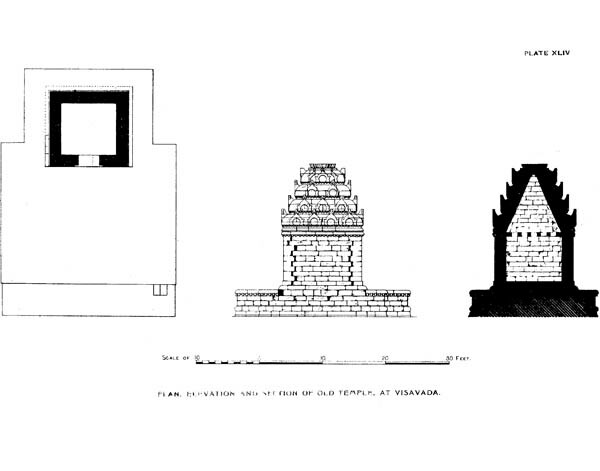 After the destruction of Valabhinagar, Anhillavada-Pattan, in northern Gujarat, rose to importance; and it is with the rulers of that state that Saurashtra became more intimately connected, and with whom we are more particularly interested in the later mediaeval temples in the province. 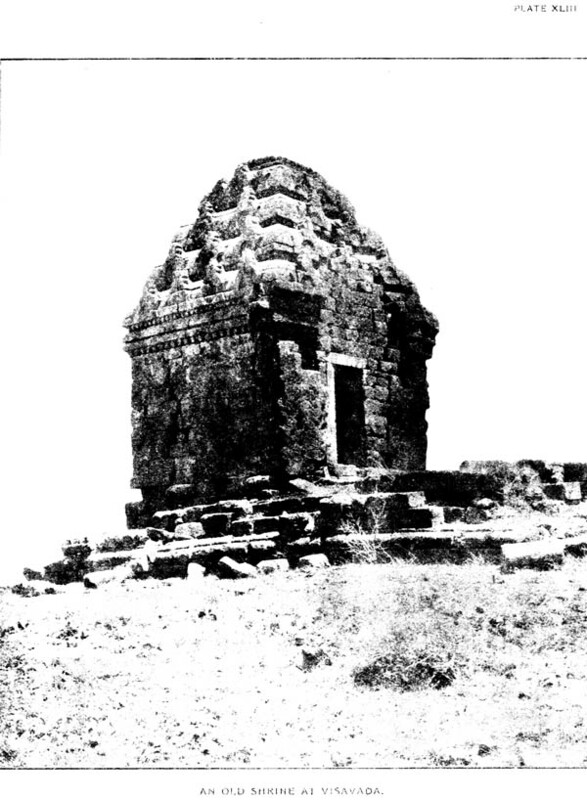 The founder of this dynasty was Wan Raj of the Chavada family, whose members are reputed by some to have been Sun-worshippers. Other tribes settled down in turn, in different parts of the peninsula, amongst them being the Gohels who established themselves at Mangrol in the eighth century. The Mers are supposed to have come from the north with the Jethwas, and those of them who entered Saurashtra settled down about Porbandar. At the installation of a Jethwa prince, at that palce, a Mer has the privilege of making the blood-mark upon his forehead. 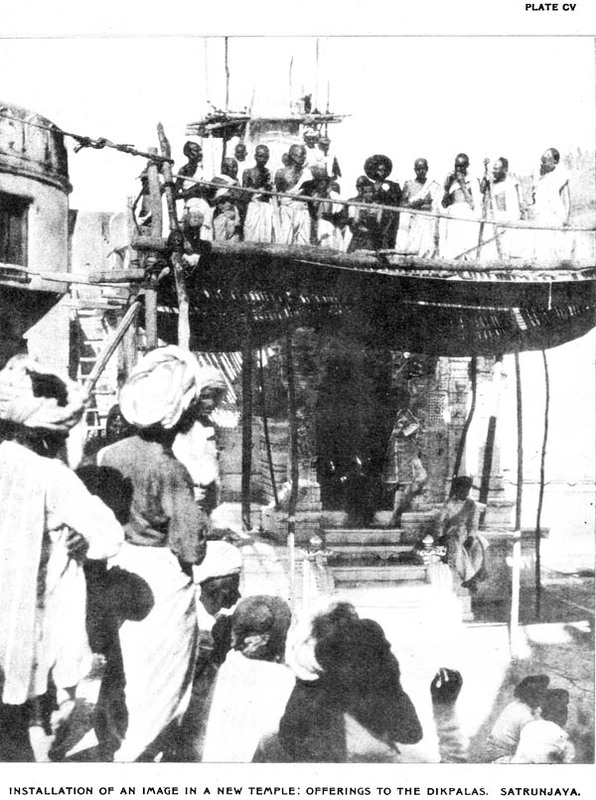 The Chudasamas, who settled at Vamansthali (Wanthali), originally came from Sind; and about A.D. 875, Ra Chuda founded the Chuda same dynasty which lasted for nearly six hundred years, when the dynasty and state were engulfed in the flowing tide of Muhammadan conquest. 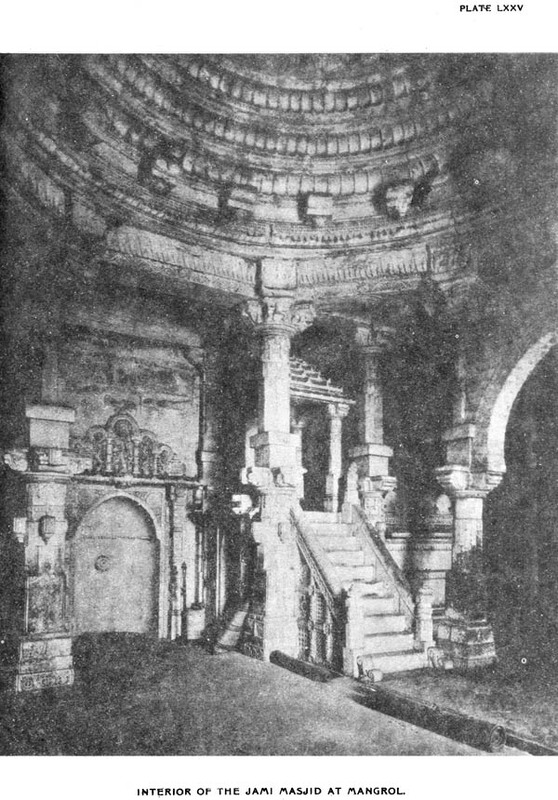 The Chudasama ruler Graharipu or Grahario I, an Abhir, or shepherd, by caste, built the fort of Junagadh, now known as the Uparkot, and it was against this chief that the Solanki ruler of Gujarat, Mulraj, after a dream in which Mahadeva appeared to him, marched from Anhillavada-Pattan. This Graharipu lived at Vamansthali "the city rendered splendid by the flags of Hanuman and Garuda," and as the ruler of Saurashtra Desa, killed the pilgrims going to Prabhasa and cast their flesh and bones entire in the way, so that though people wished to go to that tirtha, no one could do so from this terror. He ate the flesh of animals and drank spirituous liquor, and in the fight he fed the Bhutas and Pisachas and all their crew with the blood of enemies. He was taken prisoner and died in A.D. 982. 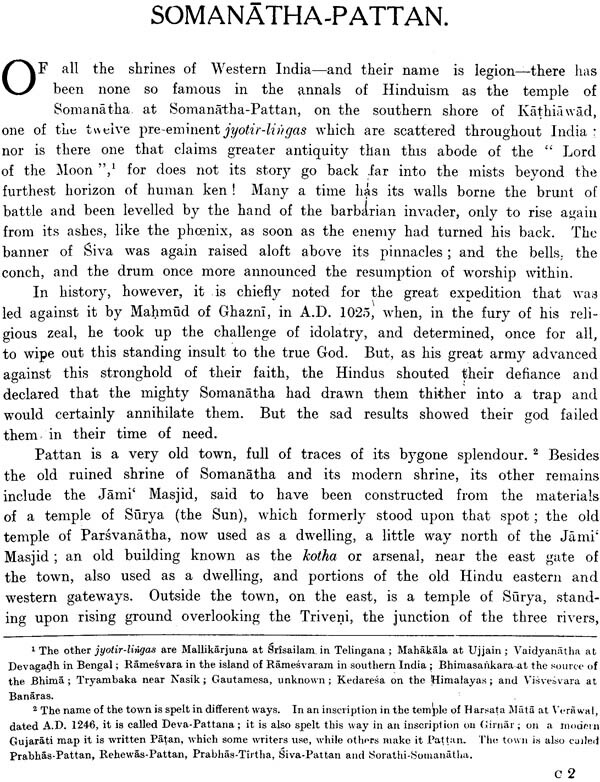 After this, Mulraja went on to Somanatha, and worshipped there before returning to his capital. The next event of importance, fraught with great menace to the prestige of Hinduism, was the ever-memorable invasion of Mahmud of Ghazni in A.D. 1025 and the sack of the temple and city of Somanatha-Pattan. 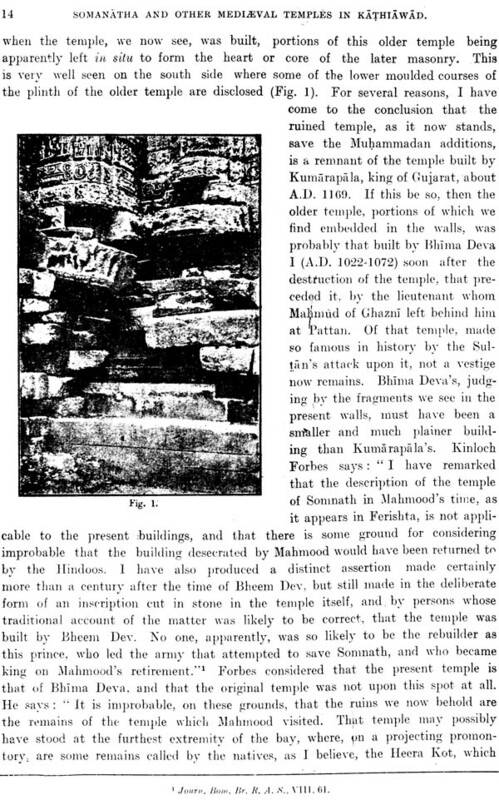 How he marched into Sorath, laid siege to the famous temple, desecrated and looted its shrine, and finally departed laden with spoils, will be found more fully described in the account of the ruins at that place. The story almost reads like a repetition of that of Muhammad Qasim's famous siege of Debal and its great temple, when the Arabs first invaded Sind more than three hundred years before. At this time Prabhas-Pattan was nominally under the rule of the Solankis of Anhillavada. 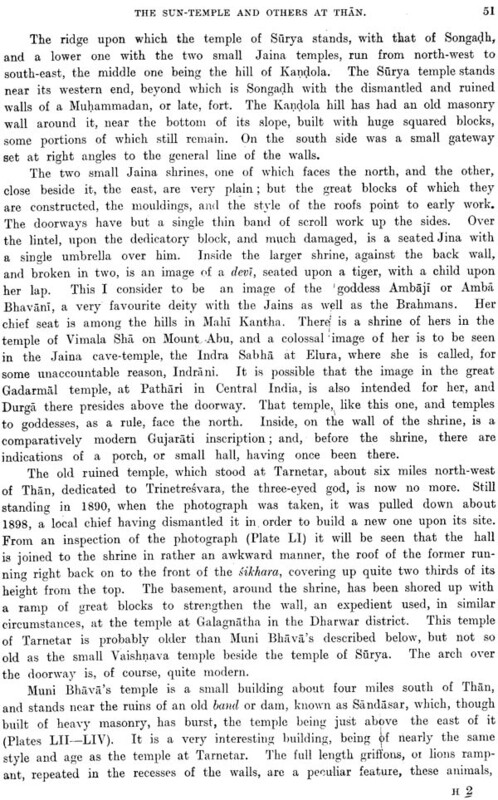 About 1090 the Jala Rajputs settled in Saurashtra, having come from Keranti near Nagar Parkar in Sind, and about the same time the Kathis first entered the province. They are said to have migrated from Sind, that great corridor from the north, to Kachh where they established themselves for a time at Pavagadh. They were Sun-worshippers; and leaving their old than in the Panjab, which became the Mul(old) than, established themselves, eventually, at their new than in Saurashtra. After them the province became known as Kathiawas. At this time the Chudasama Ras of Vamansthali were still the most important rulers in the south, at least, of Kathiawad, and it was in 1098 that Ra Navaghana II removed his capital to the Uparkot (Junagadh). The famous Siddharaja Solanki was being felt more than ever throughout Kathiawad. He was a great builder and consequently most of the finest old temples of northern Gujarat are almost invariably, ascribed to him; indeed the ordinary villagers, when in doubt of the origin of any old building, unhesitatingly credit him with its construction. But Siddharaja Jayasimha was personally connected with Kathiawad, for he was born in the province, close to the village of Dhandalpur, four kos to the west of Sejakpur, where he afterwards constructed a well and founded Dhundalpur, now Dhandalpur. 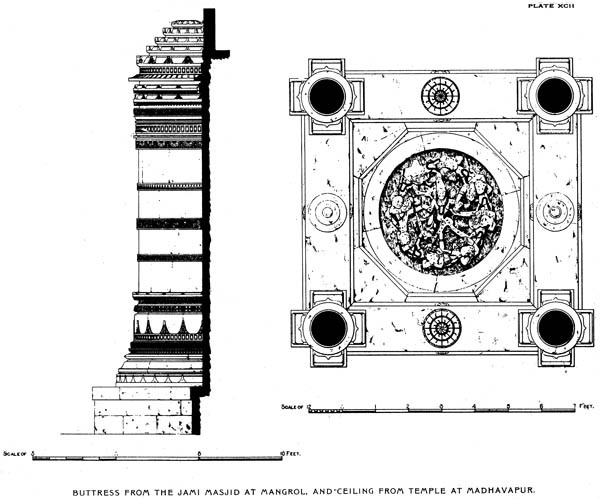 There is no doubt, however, that the finest architectural works were carried out by him and his successor, Kumarapala. 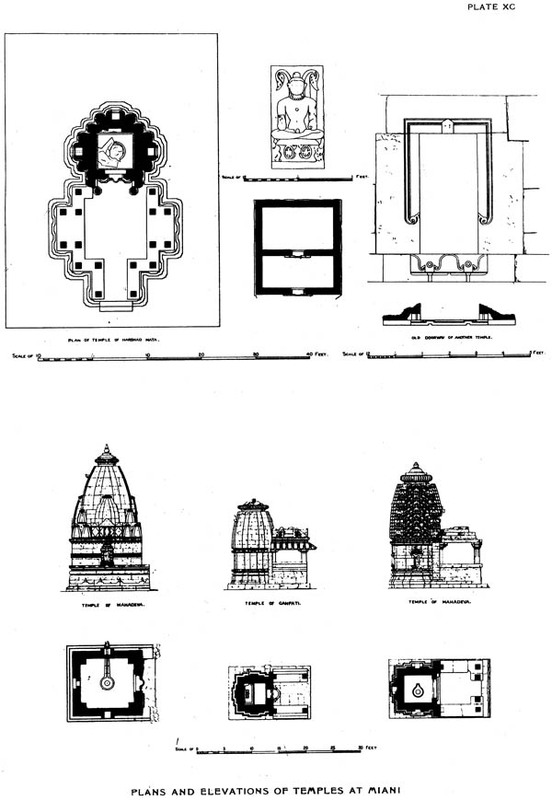 Two notable instances of these are the temples of the great Rudra Mala at Siddhapur and the reconstruction of Somanatha at Prabhas-Pattan; and about this time, were constructed the beautiful marble temple of Vimala Sha on Mount Abu and the temple of the Sun at Mudhera.